GNARBOX pairs well with a number of external devices, including card readers and external hard drives. This article is a quick rundown of the best practices for using devices with your GNARBOX! Are there any restrictions on the kind of external drives I can use with GNARBOX? If you exceed the 1AMP power limitation, the GNARBOX will "brownout". This doesn’t mean you’ve damaged your GNARBOX, it just means that there has been a power distribution issue and the GNARBOX will need to be powered down (10 second hold) and restarted. Additionally, all drives must be USB3.0 or USB2.0 compatible, and cannot rely on additional external wall socket power. SATA to USB3 converters are not compatible with the GNARBOX as they generally pull more than 1AMP of power. Can I transfer files while the GNARBOX is charging? We do not recommend performing any file transfers while the GNARBOX is charging, as it can cause power distribution issues within the device, which can lead to failed transfers. Can I plug an external hard drive into the GNARBOX while it’s connected to my computer? 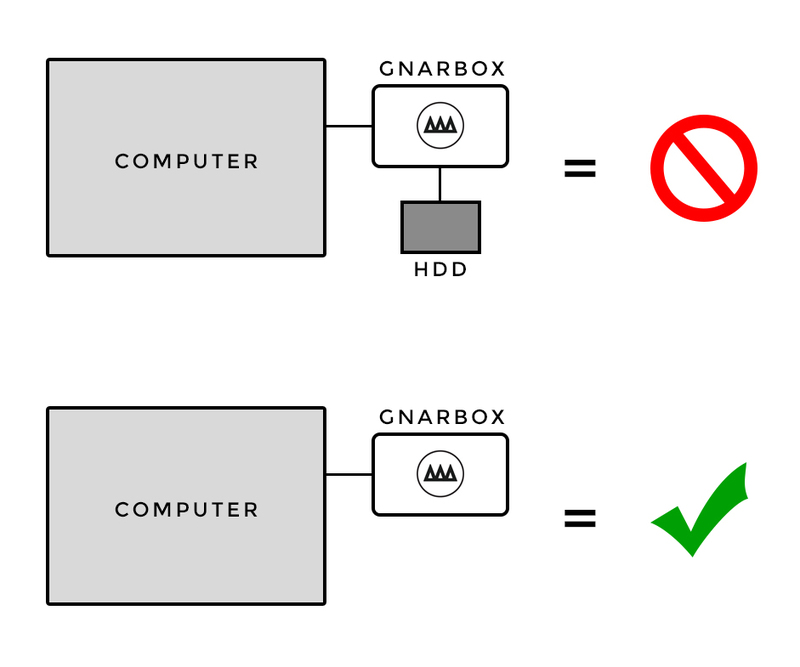 When the GNARBOX is in Mass Storage Mode, it turns off power to the other USB ports, which means that you cannot plug in an external hard drive to the GNARBOX when it is in Mass Storage Mode. Can I plug an external hard drive into the GNARBOX while it’s charging? We do not recommend running an external hard drive while the GNARBOX is plugged into power, as it can cause power distribution issues, which can lead to the GNARBOX “browning” out. This is due to the fact that charging the GNARBOX requires a small amount of power consumption itself, which, when paired with the power consumption of an external drive, causes power distribution issues. If your GNARBOX experiences a brownout, please hold the power button for 10 seconds to power down, and then reboot. Your GNARBOX will not be damaged if a brownout occurs. Can I view the contents of external drives that have more than 128GB of data stored on them? Yes! As of Release 1.5.0, drives with more than 128GB of content can be viewed by selecting the “List” view in the 'Connected Devices' screen. What external drive formats work best with GNARBOX? GNARBOX is compatible with HFS+ (Mac OS Extended Journaled), NTFS, or FAT32 (MS-DOS) formatted drives and cards. This was a big initiative for the software development team to implement compatibility across drive formats. This means your Mac or PC formatted drives will work seamlessly with the GNARBOX. Can I charge my GNARBOX while transferring files from my card reader? Can I use a USB-C CF card reader with GNARBOX? Yes, but you will need a USB-C to USB 3.0 dongle to be able to plug your reader into the GNARBOX. Pro Tip: Short on time and need your GNARBOX to charge quickly? Make sure your device is powered OFF before you put it on the charger!